Home » New Opening » NEW: Doha’s latest luxury restaurants! Looking for the perfect luxury restaurant in Doha? Whether you are searching for a budget-blowing fine dining restaurant for an extra special experience or a family-friendly spot, these three venues are the hottest new restaurant openings in town. You cannot miss Yasmine Palace as you walk down the Porto Arabia promenade. The restaurant is housed in its own block with a grand entrance, palm trees, and outdoor terraces. When it is officially open it will have 3 separate restaurants serving Arabic, Qatari and Syrian cuisines – each dining area will showcase the best of the region’s cuisine, and will have its own decorative style. It is also expected that they will introduce shisha soon. If you have visitors coming to Qatar and want to introduce them to regional cuisines in a perfect setting then this is the spot! The dining room has sophisticated elements mixed with an outdoor courtyard feel, and there is plenty of varied seating for any group size. The best spot in the restaurant has to be the smaller booths in front of the indoor fountain in front of the stage – yes they will have live muscians too! Yasmine Palace is still in its soft opening stage and will officially open in March 2018 – as such it has a temporary menu (we expect prices will increase). The service and decor has already impressed us, and we expect this to become the hottest family-friendly Arabic restaurant in Qatar. This popular Lebanese institution is a regional favourite with venues across the Middle East. Their newest Doha opening brings fine dining Lebanese cuisine to Sheraton Grand. With views across the Gulf an the city it makes for a perfect evening dinner venue. The decor has us transfixed with a sophisticated mix of mirrors, glassware and ceramics. And with the legend of Mireille Hayek behind the name you can expect a luxurious feast of tantalising flavours and refined service. The original Le Train Bleu is over a century old and can be found in Paris at the Gare de Lyon railway station. It’s opulent design and signature paintings are of such vital importance to the heritage of France that it was designated a historical monument in the 1970s. 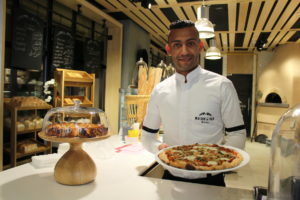 This French restaurant brand has now been brought to Qatar and can be found at Al Hazm Mall, the regions first luxury Italian-inspired shopping mall. Le Train Bleu Qatar has the same sophisticated elegance of the original, and it’s grand ceiling with its ornate gold moulding and decorative paintings adds to the elegance of the dining room.